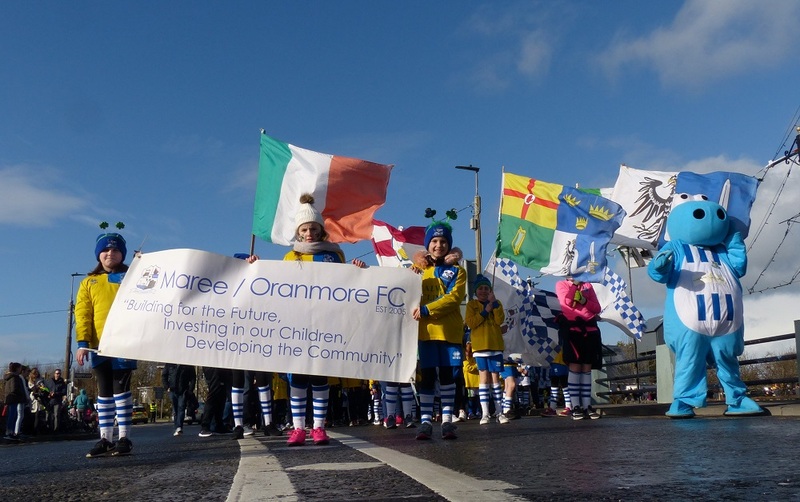 Maree/Oranmore fc had a very large club contingent in Last Sundays Oranmore St Patricks Day Parade. It was very pleasing to see the large group of Academy girls joining our traditional strong group of boys. This year also Maree/Oranmore fc had several children from our Progressive Football For All Programme participating in the parade. This enthusiastic group train every Saturday from 4pm to 5pm in the Maree Basketball Hall with Paul McCarthy the man in charge and children with a variety of specific needs and disabilities who live in our community and surrounding areas can contact Paul on 087 876871202, great credit too to the parents and club volunteers David Watterson and Mike Quirke. The weekends weather played havoc with club fixtures with the Galway FA enforcing a blanket ban on all local fixtures on Saturday last. The only game to survive was the u18 Connacht Shield Quarter Final on Bank Holiday Monday where Maree/Oranmore fc defeated a very determined Tuam Celtic side 5-1 in Oranmore. Coming back from 1 down and leading 2-1 at the interval this was a fine display by the Maree/Oranmore lads with an excellent passing game. The goals were courtesy of a brace from Alan Greene, Adam Lally, Eoin Lyons and an og. There were some fine displays all over the pitch with Shane Cox, Conor Carroll, Kevin Horgan, Darragh OConnor and Oliver McCamley especially in the opening half. The workrate of Alex Fearon and Greene in midfield was also impressive in the midfield area. Congrats to Donal Higgins of Ballinacourty on his selection on Andy Reids Irish u18 International squad for this coming weeks games against Turkey. Donal who is also an Irish schools International played all his schoolboy football with his local community based club Maree/Oranmore fc and now plays on the Galway Utd Senior side. We wish Donal well. Our Club Members Development Draw took place after Sundays Oranmore St Patricks Day Parade. The first prize of €200 went to Agnes and Joe Hawksley (Creganna), second prize of €100 went to Barry Leenane (Oranhill) and third prize of €50 went to Joe Dillon (Bluebell Woods). The winner of a pair of Premium Level Tickets for new draw members for the upcoming Ireland v Georgia game was Chris ODowd from Maree Road. You can still join our members draw for less than a fiver weekly with cash prizes by texting Fergus on 087 2457626. This coming weekend will see both of our u13 teams in League action while the u15s play in the local Cup. On Sunday our Adult Premier Side take on Traditional kingpins Athenry fc in a very interesting tie at 2pm in Oranmore. Next Sunday March 24th the club organised St Columba's Credit Union Tournament continue with the u9 and u10 boys again in action from participating clubs. Credit to Tournament Director Sean Horsman who is hoping to have the Celebration/Finals day weather permitting on Sunday April 28th.